BALTIMORE (AP) — The Baltimore mayor’s nominee to be the city’s next police commissioner on Monday abruptly withdrew his name from consideration, the latest setback to the beleaguered force where leadership instability has become the norm. A terse announcement about Joel Fitzgerald’s decision was first made in a Monday morning tweet from the Fort Worth Police Department, the Texas municipal force he leads. They did not provide any details about his reasoning, only saying Fitzgerald decided to withdraw his name. But later Monday, Baltimore Mayor Catherine Pugh said Fitzgerald was withdrawing his candidacy to “devote his full attention” to one of his sons who, she says, is facing a second brain surgery this week to “remove a mass that was discovered late last week.” Fitzgerald then issued a statement of his own, saying his decision to stay in Fort Worth to focus on his son’s health came down to a “tremendous outpouring of heartfelt support” he’s recently received there. Fitzgerald’s withdrawal comes days after Pugh’s office announced he would not be able to travel to Baltimore for highly-anticipated public hearings into his nomination because of a serious medical emergency suffered by one of his sons. But his nomination was rocky from the start. 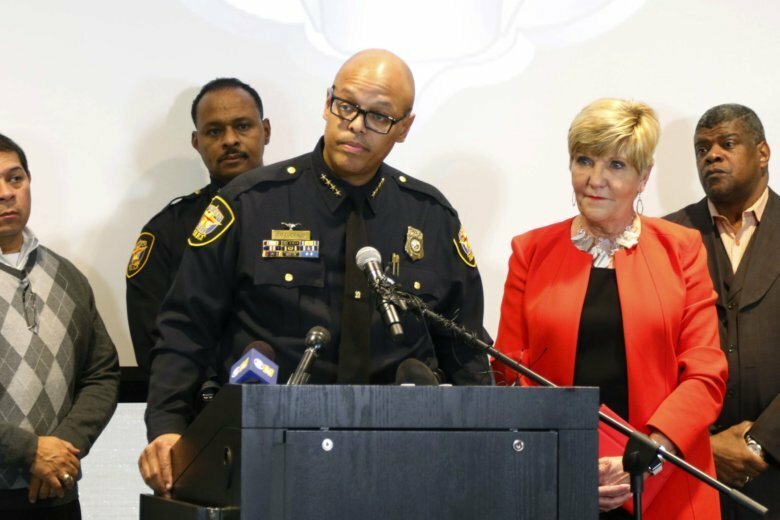 When Pugh in mid-November said Fitzgerald was her pick to be the city’s next police leader — the fourth one during her roughly two-year administration — critics in Baltimore and Forth Worth almost immediately cast doubt on his record and questioned whether he was a true police reformer. Pugh’s administration was widely criticized for a lack of transparency during the lengthy election process. The Baltimore Sun last week reported that Fitzgerald’s resume overstated some achievements since he became police chief in Fort Worth in October 2015, including embellishing his role launching a body camera program there and taking credit for the force’s ramped-up reporting on racial profiling despite a state law requiring those measures. On Saturday, the NAACP Legal Defense and Educational Fund called for Baltimore to withdraw the nomination for Fitzgerald, the first African-American police chief in Fort Worth. Baltimore’s City Hall will now go back to the drawing board to pick the city’s next police leader. Acting Commissioner Gary Tuggle — who last year removed his name from consideration for the permanent post— would continue managing day-to-day affairs of the department and Pugh on Monday said she would be “communicating further on the process to select” a leader. Katie Zafft, a University of Maryland criminologist, said she believes that Fitzgerald’s withdrawal now provides an opportunity for Baltimore to reflect on who the right person is for the crucial commissioner job. “Baltimore needs a police commissioner that fits the needs of the city. Not a commissioner that might have been great in other places, but one that has the potential to be a best fit for Baltimore. In that respect, Pugh, the council, and a panel of citizens need to get together and create a ‘job description’ for what they need in a new commissioner. Doing this collaboratively sets a foundation of transparency and trust that the city really needs right now,” Zafft said in an email. Baltimore’s police union — which had complained they were shut out of the process selecting Fitzgerald — called on Pugh to find someone with the documented success and experience to lead the force of roughly 2,300 members. It said the next commissioner should have the “appropriate autonomy” when on the job. “At this time, there are numerous others in positions of power outside the Police Department who lack any policing skill and experience but who feel competent, for some reason, to make policies that have detrimentally affected our members and, in doing so, the citizens of Baltimore,” read a Monday statement from the Fraternal Order of Police Lodge 3. The next police commissioner in Baltimore certainly faces formidable challenges: reduce one of the highest homicide rates of any large U.S. city, rebuild trust between officers and deeply skeptical residents, and win the confidence of a demoralized department racked by corruption and feuding factions. That’s all while making sure sweeping reforms encompassing fundamental aspects of police work finally take root in Baltimore, where U.S. Justice Department investigators found the police force routinely violated the constitutional rights of citizens for years. The city and the Justice Department entered into a federal consent decree mandating police reforms in 2017. Baltimore saw some modest success in reducing its violent crime scourge in 2018, but still exceeded 300 annual homicides for the fourth year in a row. In 2017, the 342 homicides notched in the city of roughly 612,000 inhabitants yielded a punishing homicide rate of 56 per 100,000 people, a rate the FBI called well above that of any other large U.S. city. Meanwhile, Fort Worth’s government said the Texas city has been “very patient and supportive throughout this awkward approval process” with the Baltimore nomination and would provide Fitzgerald the time to tend to his family. “When the time is right, we look forward to working with him to understand his desire to fully commit to the work here in Fort Worth,” their Monday statement read.